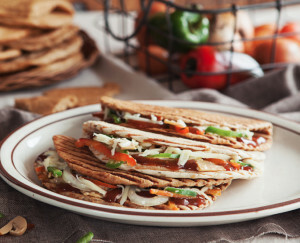 Enjoy favorites to go healthy wrap meals with delicious fillings from Plato Wraps. For 15 years, Plato Wraps has been quietly but assuredly serving value-for-money handheld meals to Filipinos on-the-go. 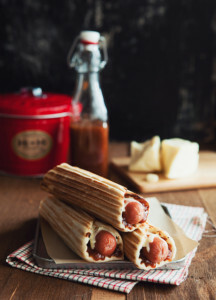 Long before wraps and to-go meals became more popular, the Seen family saw an opportunity to create a brand that would withstand shortlived food fads, while expanding their bakery line and offering something new for their customers. Plato Wraps Owner Tony Seen produced the flatbread while his wife, Plato Wraps Founder and President Kamela, complemented it with savory fillings. The plate-shaped sandwich was thus named PlatoWraps. Chunky Chicken was the first wrap offered based on a family recipe. The wrap is a delightful chunky surprise with choice breast chunks and sliced cucumber mixed with Plato Wraps’ home-made special dressing. 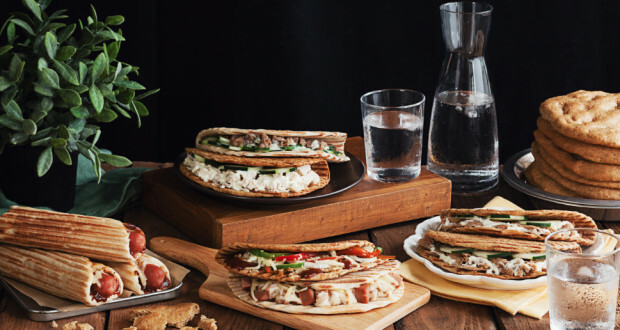 From its first filling of chicken, Plato Wraps has launched an expanded menu with Ham and Cheese, Yummy Tuna, Beef Gyro and seasonal fillings of Adoboritto, Cheese Pimiento, and Platopizza. Very Veggie fills your day with greens in a delicious wrap filled with bell peppers, mushrooms, white onions, cheese melt, and sesame seeds coated with herbs, olive oil, and pureed tomatoes. It’s never been a better time for this enduring and successful brand. 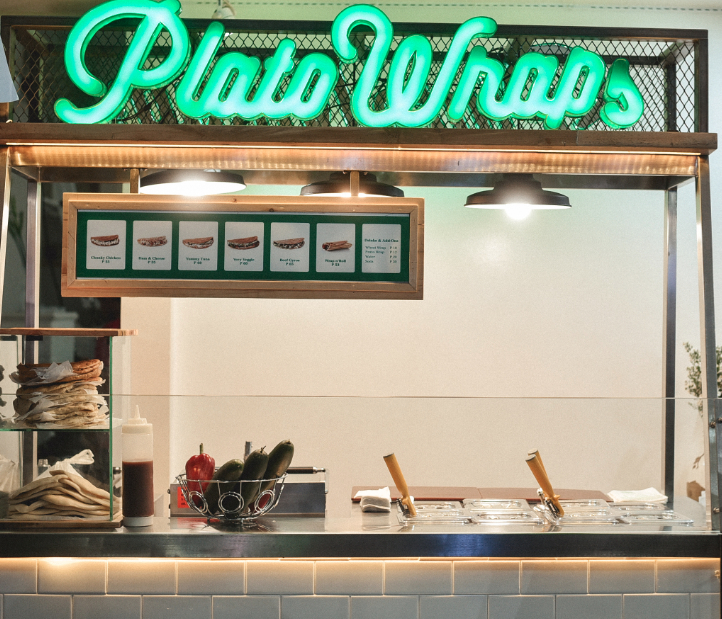 With the abundance of dining options available, Filipinos have become more discerning about what they eat and Plato Wraps fits into today’s busy cubicle-dwellers food preferences—portable, affordable, and healthy. 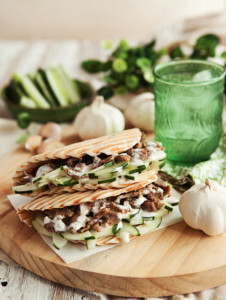 Beef Gyros offers the Greek classic of broiled steak tips with Tzatziki sauce. “Customers are now more health-conscious. They understand products that are made with less preservatives and additives. 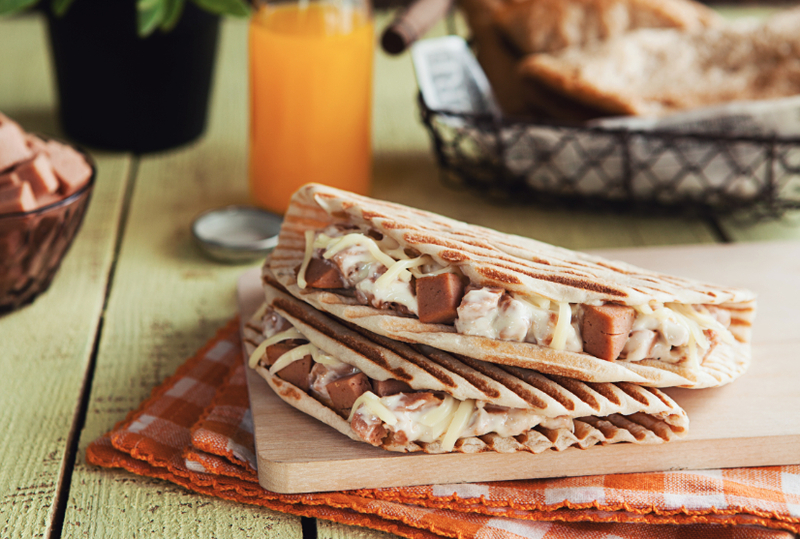 They want food that is prepared fast without sacrificing the quality and taste, “says Plato Wraps Brand Manager Kreme Seen. taste of cubed ham and cheese melt with Plato Wraps’ home-made special dressing. To celebrate their milestone and to keep up with the changing times, Plato Wraps has adopted a new streamlined look. 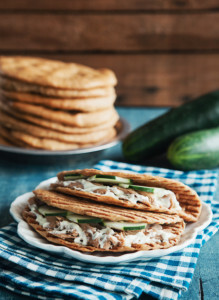 The green logo is inspired by their signature ridged flatbread, making their brand much more identifiable and delivering the fresh appeal of their product. Kamela handed the task of creating the new visual identity to Kreme, who started the project over a year ago. The team went through numerous design trials before finding the perfect look. “We sell the idea of fresh and on-the-go but the old logo did not reflect that. We wanted the new look to be aligned with this. This was very important, so we could replicate it with future plans we would have for the brand,” Krem explained. Feedback has been overwhelmingly positive for the kiosks that have adopted the new look. According to Krem, their customers have embraced it and sales have also increased. The look is a refreshing departure from the old PlatoWraps colors of red and yellow but remains true to their brand identity. “We want to stand out, so that even from afar we will be seen,” Kamela added. This is a crucial factor, especially for food kiosks that can be lost in the midst of competitors. “Even if we are just a kiosk, I believe we should also set standards,” Kamela finished. Kamela, who heads kitchen duties, is also busy concocting new items to look forward to. Plato Wraps is developing a chia wrap, as well as experimenting with fillings like bean sprouts and gourmet tuyo. 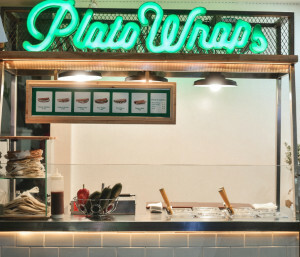 Plato Wraps will be coming out with package fillings and the plain, wheat and pesto flatbreads that customers can take home and enjoy at their leisure. Their menu boards will soon contain calorie counters for the different wraps, to complete the healthy component they offer. 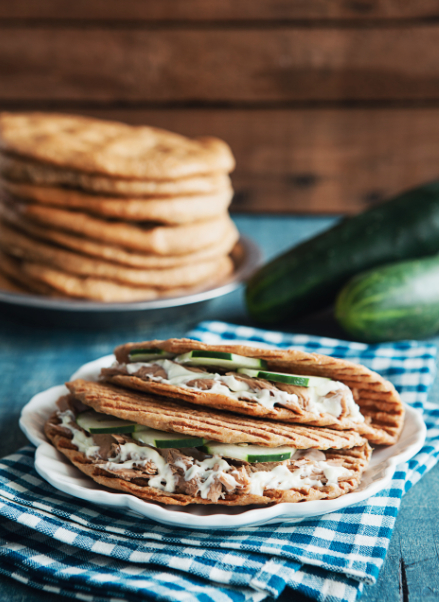 Crave for the Yummy Tuna Wrap with its shredded tuna and sliced cucumber mixed with Plato Wraps’ home-made special dressing. A standalone store is in the pipeline once the Seens find a good location. This would allow them to feature an expanded menu. Perhaps a make-your-own-wrap option will then be available. 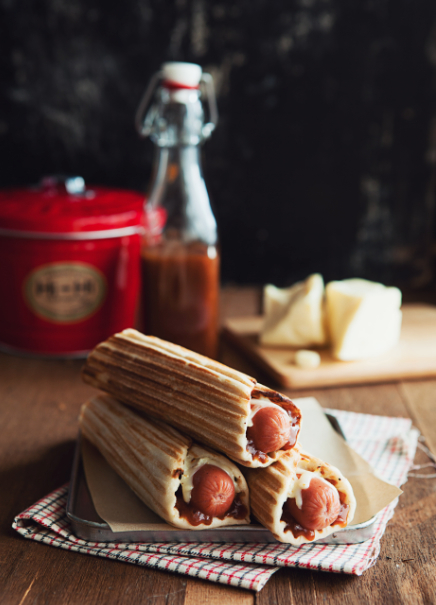 Feast on the savory Wrap n’ Roll with Plato Wraps’ special beef franks with cheese melt in herbs, olive oil, and pureed tomatoes. This brand innovation is just one of new products they have launched over the years. It is easy to see how Plato Wraps can continue to satisfy their customer’s diverse on-the-go demands with the experience and attitude the Seens have towards their business. For those who have not yet checked it out, time to wrap it up and try Plato Wraps’ new and delightful offerings. Next: Dona Elena Olive Oil is the perfect cooking oil!